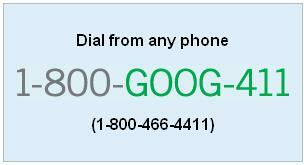 Goog-411 A cool service from Google! Note: This service is available only in the USA & Canada, and just in English! Many of G1 phone and iPhone users use Google search by voice options on their phones today, but did they know that Goog 411 existed before any other Google voice service? The idea is very simple, Dial the number and speak your question. The options available are great too, watch the video below for a great example, and remember that this cool service is not just to find a great Sushi place, the system can text you information, connect you to your result listing for free, figure out your location based on your number (You can always change your location) or even “Map It” will send the map to your mobile phone. And it’s all for free! The only charges you pay is to make the call or receive the SMS if you requested, but no 411 charges at all. Cool huh!